In this article you will learn about the different throttle types (twist grip, thumb, push button), pedal assist types (torque sensor and cadence sensor) and which mode may be best for you. 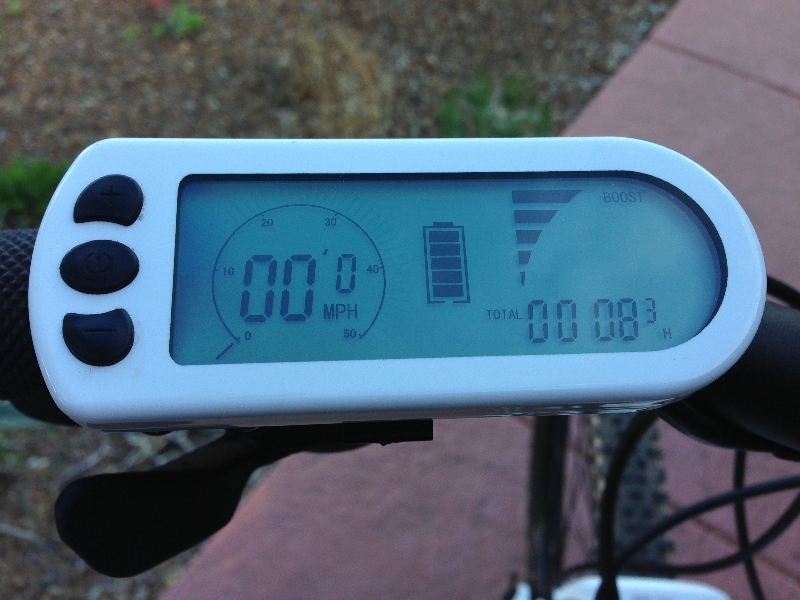 A lot of e-bikes in the US have the throttle feature. In some countries the throttle electric bike is not allowed; only pedal assist. This is the half grip twist throttle on the eFlow E3 Nitro electric bike. The throttle is engaged by twisting the throttle; similar to a motorcycle or scooter. This is the most common type of e-bike throttle. 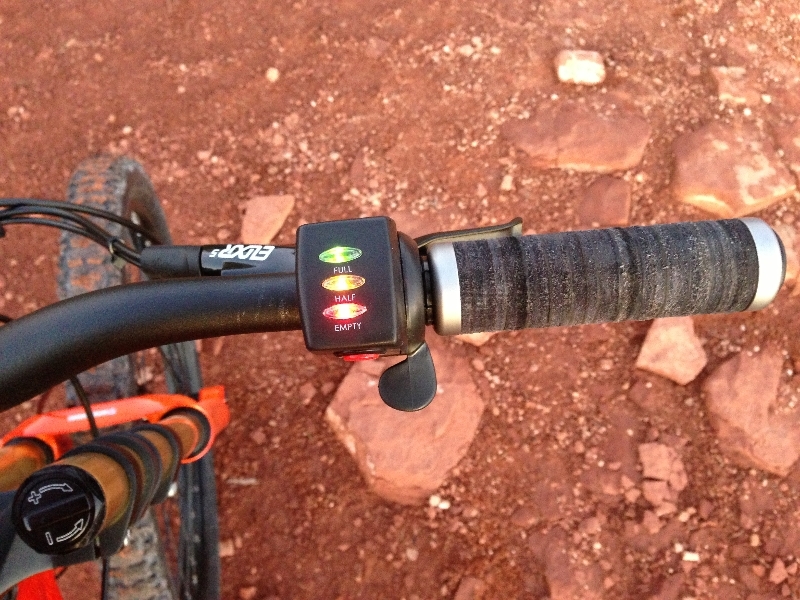 This is the thumb throttle on the Prodeco Outlaw SS electric mountain bike. The throttle is engaged by pushing the throttle “paddle” forward with your thumb. 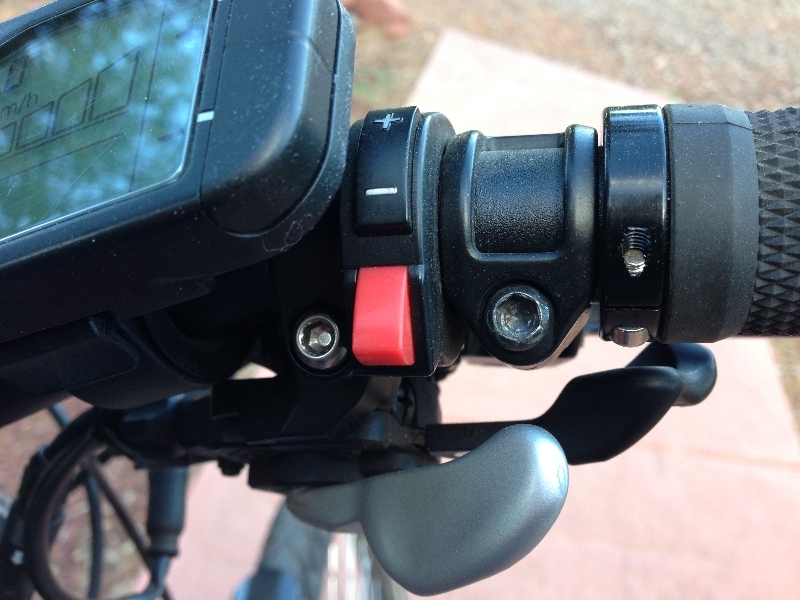 This is the thumb throttle of the BionX system on the OHM XS750 electric bike. The throttle is engaged by pushing the red button forward with your thumb. This is the push button throttle on the Clean Republic Hill Topper electric bike kit. This particular throttle is simply an on/off switch; there is no way to adjust between low and full power. There are a few different pedal assist types on the market; the torque sensor and the cadence sensor systems. 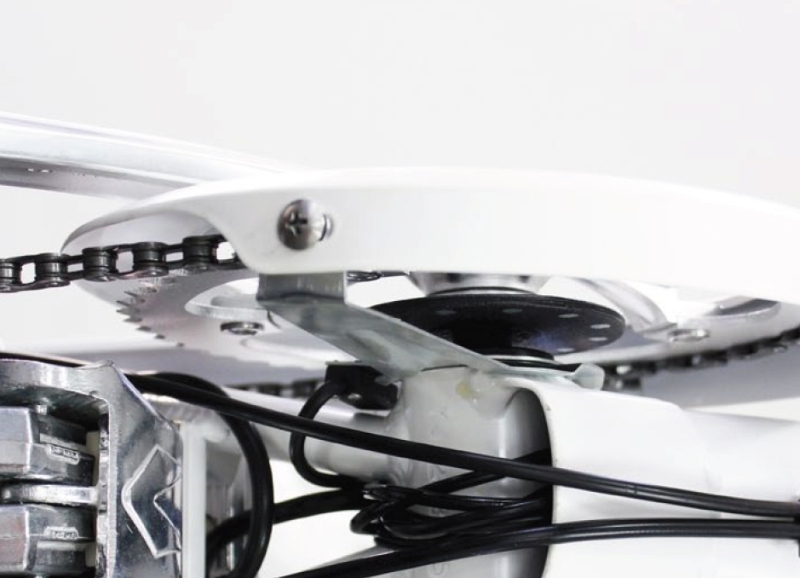 The torque sensor pedal assist systems measure the amount of power you are putting into the pedals and it will increase or decrease the electric assist based on your pedaling power. The torque sensor systems have a very intuitive ride feel because they emulate your pedal power very well. They are also generally found on the more expensive e-bikes or e-bike kits. The torque sensors are generally found in the bottom bracket, rear drop out, or in the rear hub motor. This is the TMM4 torque sensor on the inside of the rear dropout of the Easy Motion Neo Jumper electric mountain bike. The cadence sensor pedal assist systems provide assistance when the cranks of the bike are turning. Compared to the torque sensor system, the cadence sensor will just provide the assist based purely on the level assist you have selected and it will not increase or decrease the assist based on your actual pedal power. You could be pedaling very lightly or very hard and it will provide the same level of assist. 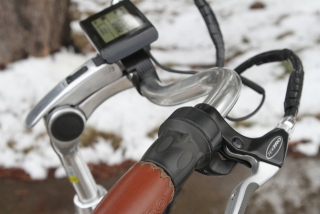 This is the cadence sensor at the cranks of the Pedego City Commuter electric bike. If you want the option to simply cruise along and pedal or not pedal, then you should consider a throttle e-bike. 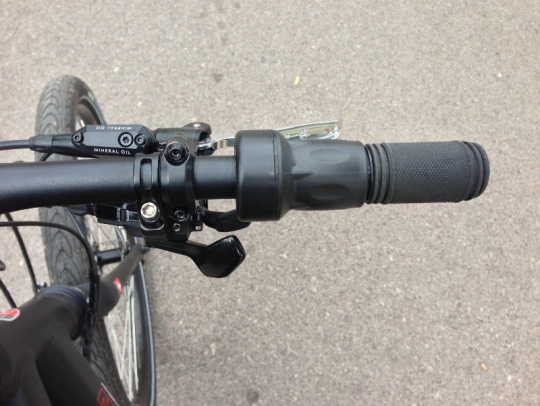 If you enjoy pedaling and want to a more intuitive e-bike then go for the pedal assist (pedelec). More and more e-bikes are coming with both systems so you may have the option of using both systems depending on your mood. I hope this helps in understanding the different electric bike assist modes. I recommend that you visit your local electric bike dealer to try the throttle and pedal assist modes for yourself to see which one fits your riding style. If you already have an electric bike, which mode do you prefer and why? Please leave your comments in the section below. Thanks for all the great articles Pete! I am a fan of as little components as possible. The less parts and pieces, the less chance of failure. That’s just my opinion. I do not offer pedal sensor components on my DIY kits but I am open to learning what people think / want. I’ve had an ebike kit on my old mountain bike for over five years. It is frontwheeldrive, with a thumb throttle and regeneration button for downhill recharge. I’ve ridden pedelecs and, on the whole, don’t like them. find it annoying to have to adjust power assist, and it can be quite alarming/dangerous if on high assist when you pedal off, and you get too great a boost. The thumb throttle is sensitive, easy to adapt to all conditions, works in well with how hard you want to pedal(I never ride mine without pedaling) and i swear by the regen button for both braking and battery recharge. you can overcome the aching thumb/wrist syndrome on a longer ride by setting the thumb throttle on right hand handlebar so your thumb naturally pushes it away from you. And, it’s simple. I like my Pedego Interceptor step through with throttle capabilities. Both my wife and I are in our 60’s ,work out and swim several times a week and at least 3 rides a week on our Pedego’s . Both of us have knee replacements and I a fused back. This type of bike suits us especially on hills ,headwinds or when tired to know we have some power back up on our 20-30 mile Greenways in Raleigh . We pedal as much as we can for cardio exercise and just plain fun in the fresh air! Pedelecs are pointless. Most people who buy electric bikes want to cruise on electric and pedal just a little. Plus you can keep up with traffic better with throttle and more speed. Its actually dafer for you. Some pedelecs you never know when the darn motor will kick in. The pedelec sensor fails often. Its a nightmare for ebike companies to fix! I use my pedelec mode all the time to save on battery charge. The throttle is good for starting off then I switch to pedelec assist level 3. Also my hand gets sore holding the throttle on all the time. I prefer full throttles to half throttles, but my bike only comes with half throttle. 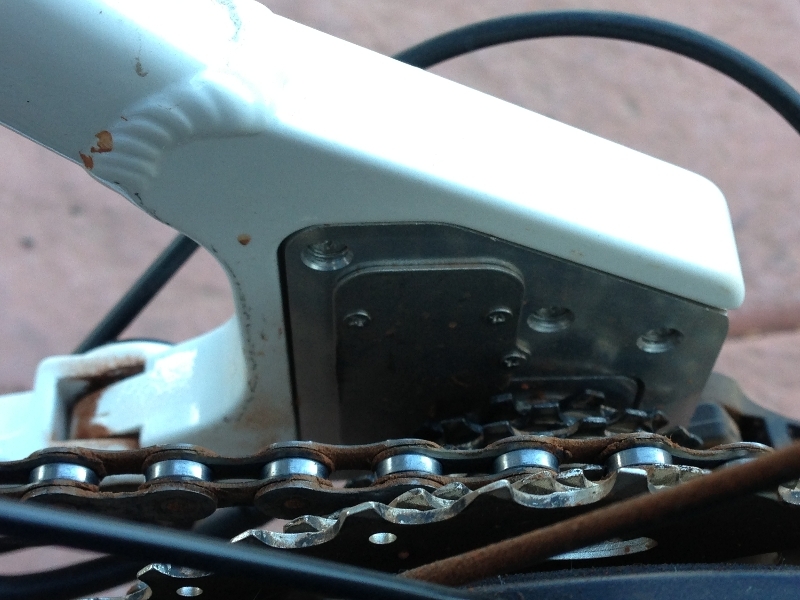 A problem with my pedelec mode is the motor stays on for 2 to 3 seconds after I stop pedaling. I would be better if it cut off soon as I stop pedaling. I like having both options. The throttle is great for getting a quick burst of speed, like when going through an intersection. It is also good when you are riding in a situation that requires you to be able to vary your speed quickly. I like the pedal-assist when riding on open stretches of road. On my Pedego Interceptor I can change the pedal-assist mode very easily so if I need to drop down from Super Girl #5 to Modest Mouse #2 I can do that quickly. (3/5) in 3 km of switchback trail climbing about 700 m.
I have ridden 75 km of paved rolling & flat valleys and got home with 1/2 my power left. so by simply gearing down ones electric bike and then spinning fairly fast also as well with half the pressure on ones pedals for example; the corresponding electric motor assist will also be reduced to ones electric bike; this will help to improve, preserve and optimize the electric bike batteries range in miles. I ride a throttle;/combo OHM. Allows me to avoid murdering my knees at all this stops signs that we shouldn’t breez right through. You all stop. Right?